Celebrating our struggle for independent living: no return to institutions or isolation. Such issues were nascent in the early 1960s and surface in a film called The Contact (1963), featuring a young John Hurt in the role of Max, a physically disabled teenager with cerebral palsy. The film was sponsored by the Spastics Society (now known as Scope).. Aimed at (able-bodied) young people, it addresses the mutual benefits of ‘inclusion’ and how easy it is to make (wrong) assumptions about someone with a disability. Still from The Contact, starring John Hurt. 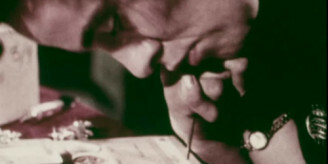 The film is one of many produced by Scope which, taken as a cohort, sign-post the struggle for equality of people with disabilities since the 1960s – a campaign that took many decades to achieve. It was only in 1995 in the UK when the Disability Discrimination Act in 1995 was passed, followed by the Equality Act in 2010 that the civil rights of disabled people were protected. These days, it is hard to imagine an able-bodied actor being cast as the lead in a film about disability. In 1963, John Hurt was at the beginning of his career as an actor. The film also features two well-known British actresses, the late Wendy Richard and Pauline Collins; they are on screen together at 5 minutes into the film. 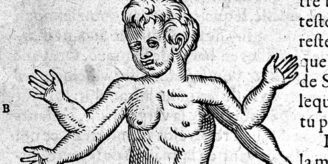 The other five able-bodied actors were cast in a number of television programmes from the 1970s but without the same level of fame. Still from the film featuring youthful appearances by Pauline Collins (left) and Wendy Richard (right). The film portrays the fictionalised story of Max encountering some teenage boys – he is knocked to the ground when crossing the road, he is then (somewhat reluctantly) invited to join them at a youth club. When they realise that, apart from walking, he is just like them and sitting GCE exams, their attitude relaxes. Max narrates his life in a residential home and tells them about some of his friends there: young people with physical disabilities are shown in the home relaxing and being to all intents and purposes ‘normal’ teens (dating and studying), although they are not given a voice. 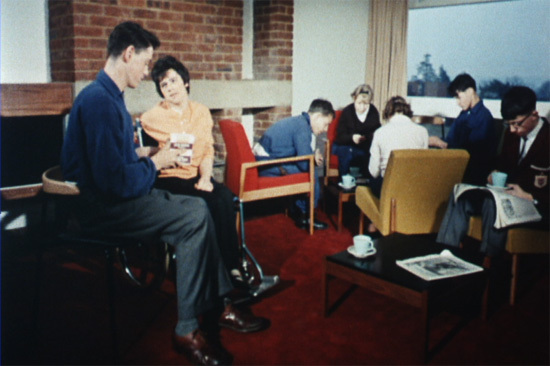 Still from the film showing disabled people at a residential home. More recently, Scope has given a voice to these silent people in their Speaking for Ourselves oral history project, which interviewed 17 of the organisation’s members about their experiences growing up. As a result of this project, a pack was put together for secondary schools as part of the national curriculum. 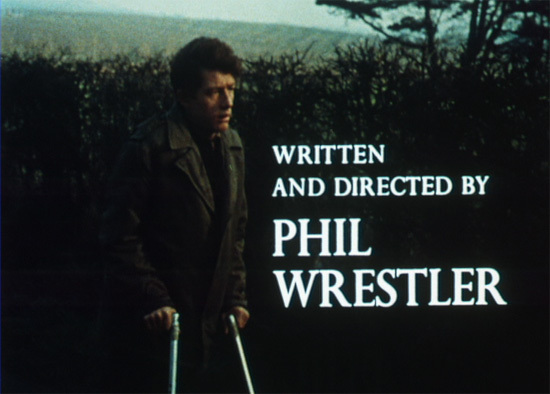 The film boasts a few other interesting credentials; the director and writer Philip Wrestler has a screen credit for second unit director for the movie The Italian Job (1969) and the music and lyrics to ‘I didn’t know’ (which chime with the theme of the film) were specially composed and performed by a rock & roll group, The Impacts. Looking at the band logo on the drum kit for the group, it is most likely to be a UK-based 5 piece group with the same name, and not the better known 7 piece US rock & roll/surf group, The Impacts, which disbanded in 1966 without any major hits (although the lead guitarist is still recording). 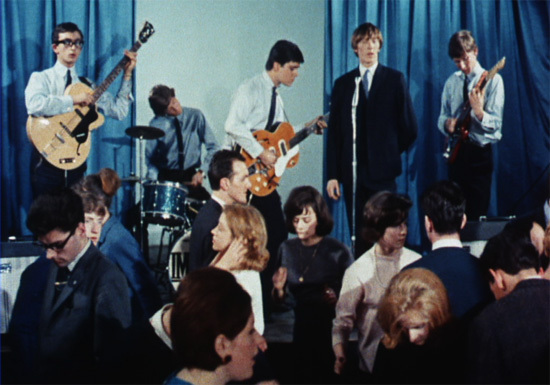 Still from the film featuring the band The Impacts. John Hurt, the BAFTA award winning British actor, features in a number of other Wellcome Library holdings. One of his most memorable roles was in the 1980 David Lynch directed film, The Elephant Man, and he also narrated a documentary called The true story of the Elephant Man in 1997 that re-evaluated the medical evidence about John (Joseph) Merrick’s (the Elephant Man’s), medical condition. In the 1980s, Hurt was also the voice of the government’s HIV/AIDs campaign: ‘AIDS, don’t die of ignorance’ and narrated the public information films Monolith and Iceberg. More recently, Hurt co-starred in a Wellcome Trust funded short film about dementia, Love at first sight (2010), with Phyllida Law. Set in a residential care home, it shows a day in the life of 70-year-old Arthur, who falls in love with the new resident, a woman called Ruth. The film has won 14 awards (and counting) around the World.